The Battle of the Philippine Sea (June 19–20, 1944) was a pivotal U.S. naval victory, effec­tively elim­i­nating Japan’s ability to both con­duct large-scale carrier actions and rein­force its gar­ri­sons to the east in the Mari­ana Islands chain. The most impor­tant islands in the Mari­anas were Guam (an Amer­i­can ter­ritory cap­tured by Japan on Decem­ber 8, 1941), Tinian, and Saipan (two Japanese World War I man­dates). In the 1940s Saipan’s civil­ian inhab­i­tants were predom­i­nantly Japa­nese, not Cha­morro as the indigenous peoples of the Mariana Islands are called. Amphibious U.S. Marine and Army divisions had landed on Saipan begin­ning June 15. On this July 6, 1944, night, 3,000 Japa­nese defenders on Sai­pan—real­izing that they could not defeat the invaders—hurled them­selves against Amer­i­can lines in the largest ban­zai charge of the war. Led by Japa­nese offi­cers swinging swords over­head, the sui­cidal charge of able-bodied men in the front ranks, the lame and wounded in the rear, some armed only with rocks or knives mounted on sticks, left most Japa­nese attackers dead and battle-hardened Marines and soldiers shaken to the core. The self-inflicted slaughter was not over. The next day brought another suicidal ban­zai charge and mass sui­cides, in­cluding that of Emperor Hiro­hito’s hero at Pearl Harbor and Mid­way, Vice Admiral Chūi­chi Na­gu­mo. Two U.S. Army regi­ments were almost de­stroyed, losing 650 killed and wounded in this last-ditch charge on July 7. Hund­reds of Japa­nese civil­ians, brain­washed by Japa­nese propa­ganda that they would be killed if captured or imbued with the national philo­so­phy that sui­cide as “a shield for the Emperor” was an honor­able death, jumped off cliffs, drowned them­selves in the sea, were blasted out of caves with their uni­formed defenders, or blew them­selves up with gre­nades. All told, 29,000 Japa­nese mili­tary and 22,000 civil­ians (over half the local popu­la­tion of the island) died ver­sus 3,426 Amer­i­can dead and 10,364 wounded, making Saipan the most costly victory to date in the Pacific War. News that Saipan had been lost caused Japa­nese Pre­mier Hideki Tōjō and his cabi­net to resign later in the month. Until Saipan’s capture the Japa­nese popu­lace con­tin­ued to believe that suc­cess in the war remained pos­sible. Now Japan’s leader­ship was forced to begin con­sidering the reality of defeat. Marine General Hol­land M. “Howlin’ Mad” Smith, ground com­man­der of the assault on Saipan, declared that the U.S. victory “opened the way to the home islands” by pro­vid­ing secure air bases for the new long-range heavy bombers that were now within striking dis­tance of all Japa­nese cities. Four months later one hun­dred B‑29 Super­for­tresses departed Saipan’s new U.S. airstrips for their first massive air raid over Tokyo. Left: U.S. Marines take cover on Red Beach, June 15, 1944. The inva­sion fleet of hun­dreds of ships carried more than 70,000 Marines and sol­diers. 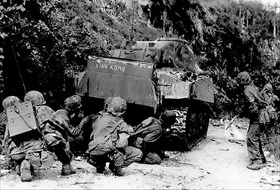 Shelling the 72-square-mile, pistol-shaped island began on June 11, 1944, and lasted for more than three days. 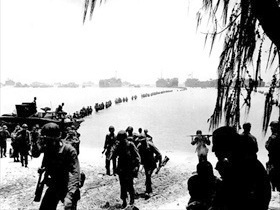 Landings began on the west side on June 15 when the 2nd Marine Divi­sion hit Red and Green beaches and the 4th Marine Division hit Blue and Yellow beaches. Right: Soldiers of the U.S. Army 27th Infantry Divi­sion, green rein­force­ments, dis­em­bark from LSTs and pro­ceed across a coral reef on the extreme southwest coast of the Saipan. Photo from June 16 or 17, 1944. 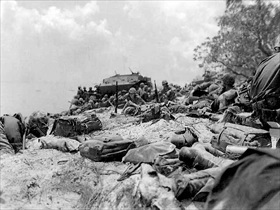 Left: Marines take cover behind an M4 Sher­man tank while clearing out the northern end of Saipan island, July 8, 1944. 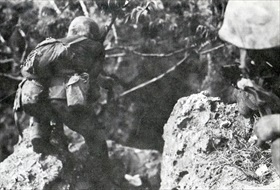 Right: Holding a Colt 45 pistol, a Marine moves cau­tiously through the Sai­pan jungle, July 1944, as he and his pla­toon fer­ret out the enemy. Out of a 30,000-strong garri­son, less than 1,000 Japa­nese were taken pri­soner. The sui­cides and ban­zai charges were called gyokusai, which can be roughly trans­lated as “breaking the jewel,” a refer­ence to the destruc­tion of an entire Japa­nese unit. Gyokusai can only be made at the behest of Imperial General Head­quarters, the Japanese equivalent of the U.S. Joint Chiefs of Staff. 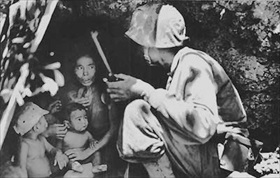 Left: Marine Lt. Robert B. Sheeks, an Intelli­gence and Japa­nese Lan­guage Offi­cer, coaxes a ter­ri­fied island native (a Cha­morro woman) and her chil­dren into aban­doning their hiding place, circa June 21, 1944. Using a com­bina­tion of sur­render leaf­lets and ampli­fied voice appeals, Sheeks per­son­ally ended up saving the lives of hun­dreds of Japa­nese civil­ians and service­men by being able to talk them out of the many caves in Sai­pan’s and neighboring Tinian’s volcanic landscape during combat in 1944. Another Japanese-language speaker, Marine Pvt. Guy Gabal­don, was respon­sible for single-hand­edly nego­ti­a­ting the surrender of 800 Japa­nese sol­diers and civil­ians on Sai­pan and turning them over to U.S. mili­tary author­i­ties. For his exploits, Gabal­don became known as the “Pied Piper of Saipan.” On Tinian he con­tinued his remark­able career, capturing an­other 700 Japa­nese. The Navy awarded Gabal­don the Silver Star medal, which it up­graded in 1960 to the Navy Cross, the second highest U.S. military decoration. 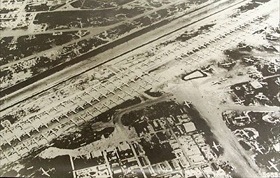 Right: Isley Field on Saipan is filled with hundreds of four-engine B‑29 Super­for­tresses in this mid-1945 photo. The Mari­anas were desired by the U.S. as bomber bases to reach the Japa­nese main­land, with Sai­pan attacked for that reas­on even before the U.S. moved to reca­pture Guam. Once cap­tured, Sai­pan and Tinian were used by the U.S. Twen­tieth Air Force because the islands finally put main­land Japan within round-trip range of B‑29s. In response, Japa­nese air­craft attacked the bases on Sai­pan and Tinian from Novem­ber 1944 to Janu­ary 1945. Both the Enola Gay and the Bocks­car (which dropped atomic bombs on Hiro­shima and Naga­saki, respec­tively) flew their missions from Tinian’s “North Field,” whose four runways comprised the largest single airport in the world at the time.